Welcome to the Void, Janet (D’Arcy Carden) and Michael (Ted Danson) and...Janet. 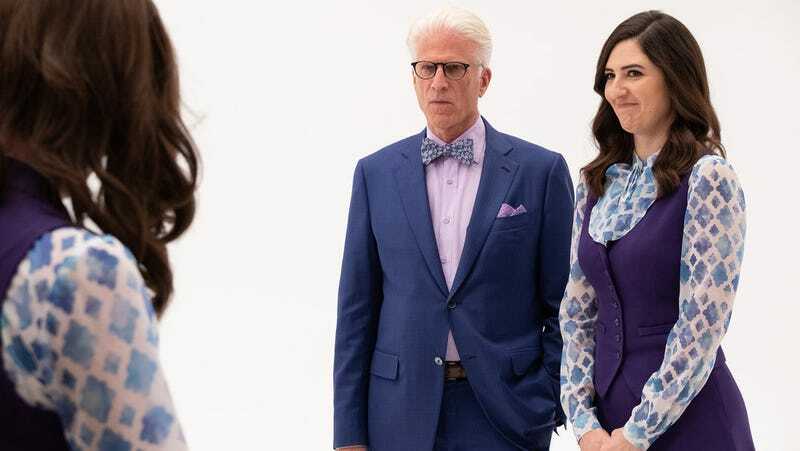 Hot off the excellent news of its renewal for a fourth season, The Good Place returned from a brief hiatus to show us what happened when Janet brought the humans and Michael into her “void” to protect them from demons on Earth. The result? Yet another new scenario for the ever-changing show. But before we get to that, we have to address the other big things that happened in “Janet(s).” The first is the sight of D’Arcy Carden—who is already generally fantastic as the optimistic, all-knowing AI Janet—getting to play all four of the show’s humans in a very Orphan Black-like turn. You see, in Janet’s void space, there’s an unexpected side effect: The humans, who are now dead on Earth again, physically transform into Janet. (Michael looks the same; to his relief, his hair is still amazing.) Carden nails everyone perfectly: delightfully haughty Tahani, dopey Jason, befuddled Chidi, and exasperated Eleanor. Tahani-Janet and Jason-Janet don’t get a ton to do while the quartet is lounging in Janet’s void (though they do accidentally discover that Janet was once married to Jason in one of the many Bad Place reboots), but Chidi-Janet and Eleanor-Janet finally have it out over their nebulous relationship status. Head accountant Neil (Stephen Merchant)—his mug says “Existence’s Best Boss”—and Neutral Janet (D’Arcy Carden). The neutral zone (which comes complete with its own Neutral Janet, giving Carden yet another persona to play—maybe this is an early Emmy run) is where the celestial accountants toil in their dreary cubicle farm, tabulating the “points” that determine whether humans are sent to the Good Place or the Bad Place. (Planning a Lord of the Rings-themed destination wedding? You’re screwed.) Michael’s looking for proof that the Bad Place has been tampering with the point system, but instead realizes that the system itself is rigged to make sure that even the most saintly humans are doomed to an eternity of torture. In fact, the last time anyone got into the Good Place was 521 years ago. As they have so often before, the “interdimensional fugitives from everyone in the universe” (which includes Michael and Janet at this point) have to act fast to save their butts. After Janet points out that the best and only person who can fix whatever’s wrong with the universe is Michael, the reformed demon snaps into action. Having seen the pneumatic tubes that funnel souls into the afterlife, he shoves past the accountants—not difficult; they’re all office drones who get jazzed about cake in the break room—and instructs the gang to get sucked up through the Good Place portal. What does that mean? Well, for the first time on a show called The Good Place, HOLY! FORKING! SHIRT! BALLS!, we’re going to see the real Good Place! So far it just kind of looks like a room filled with stuff from, uh, a long time ago...but presumably the next episode will reveal what, and who, is waiting to meet the newest residents. Alas, we’ll have to wait a while to find out what happens next. The Good Place takes yet another hiatus for the holidays—then it will move to Thursdays at 9:30 p.m. on NBC and finish out its third season with episodes on January 10, 17, and 24. IT WAS A CORNER PIECE!